To climb a mountain is one of my biggest dreams ever. You know I have done a lot of long road trips, explored a number of astonishing caves, bathed on many white sand beaches, walked miles of distance just to visit structures of historical importance, but I never had the chance to bring myself on a mountain's peak. And so, December 28, 2011 is the date to be remembered, it is the date that I finally conquered my first mountain. Mt. Daguldol is the mountain now close to my heart. 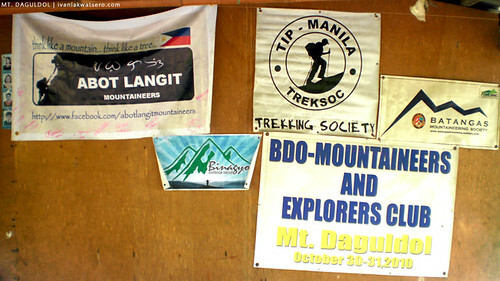 With the company I was with and the awesome side trips we ventured, it surely was a memorable first climb. It all started early in the morning of the 28th of December 2011, the four of us traveled to San Juan, Batangas aboard the first trip of RRCG Bus (I really have no idea that there's a bus in Buendia-Taft that will travel direct to San Juan, Batangas). 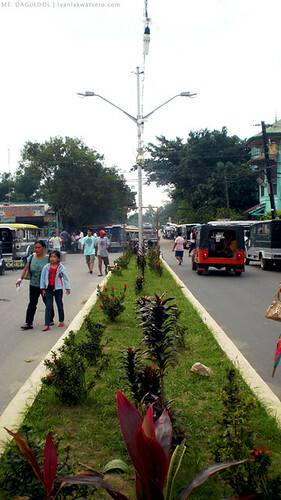 | RRCG Bus Line offers trips direct to San Juan, Batangas via Ibaan. It would only cost P188 (as of 2011) from their terminal at the corner of Buendia and Taft Avenue. Travel time would only take 2 hours. At around 8AM, we reached the town of San Juan, alighted somewhere near Puregold, and from there we walked to the jeepney terminal located near the town market. We were after the first trip to Brgy. Hugom but we arrived a few minutes late. We had no choice but to wait for the next jeep to get filled with other passengers - sigh - at least we have some chocolates to nomnom while waiting. Finally, after more than 30 minutes, our jeep left for Brgy. Hugom, yehey. I fell asleep almost the entire travel time. 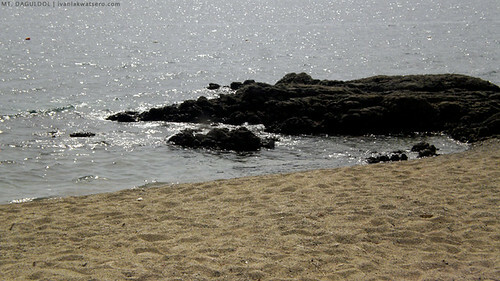 What I remembered is that we passed by a series beach resorts (yup, we passed by San Juan's famous Laiya beach). 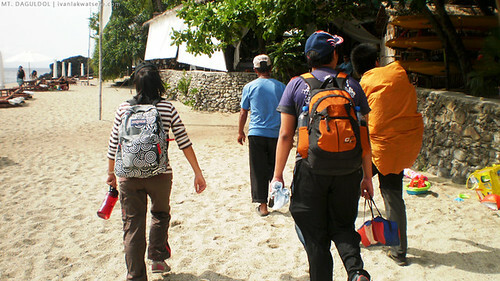 Then by 10:10 AM, we arrived at Brgy. Hugom. We headed first to the Barangay Hall for the registration, we knocked but it seemed that no one was inside. A man approached us and directed us to a house at the back of the hall. There, we paid the necessary fees and hired the mandatory guide. Before we started the trek to Mt. Daguldol, we first filled our growling stomachs with cheap food from the carideria found along the way. 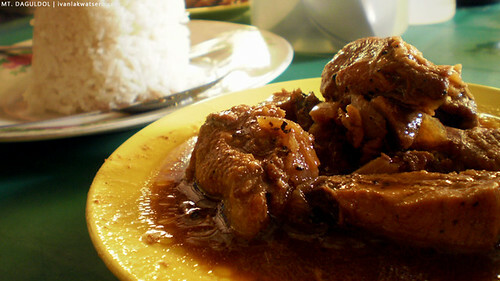 Adobong Chicken, adobong pork and adobong atay are among the ulam of choice. "Adobo day ata," I asked myself. They also have a singang na isda which actually tasted like paksiw, haha. 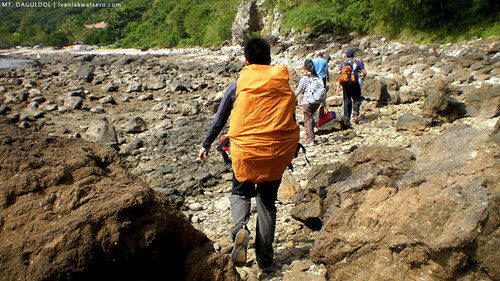 At 10:52 AM, the four of us with Mang Lizardo (our guide) started the long, strenuous trek on the stretch of Laiya beach. 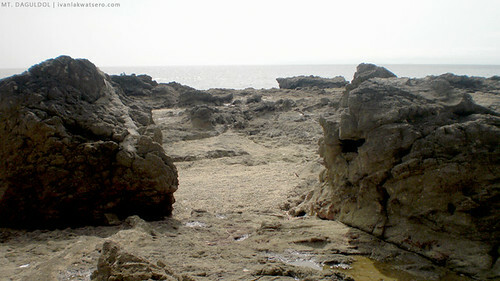 Along its coast are various rock formations, marvelous and massive, shaped by the powers of nature. 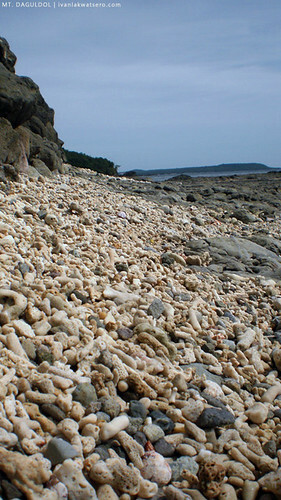 Instead of fine white sand, debris of hard corals, shells, pebbles and smooth rounded and flat rocks fill the shores of Laiya. 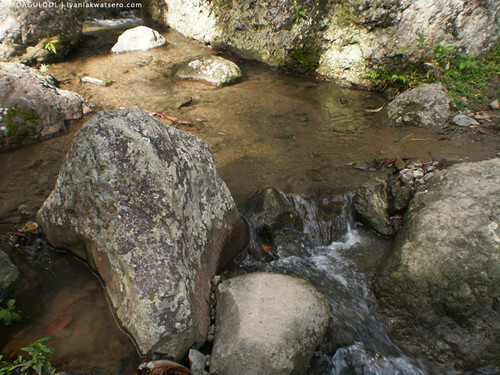 Thirty minutes was spent before we reached the first sitio - Sitio Biga - at the foot of the mountain. 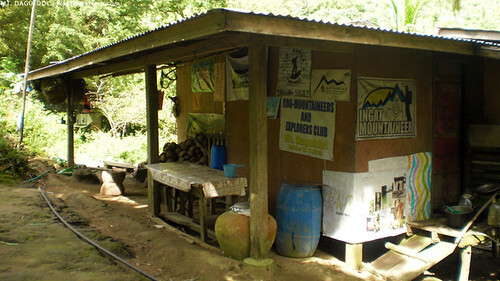 We were able to sit and rest for like 5 minutes, in front of a sari-sari store at Sitio Biga. We hadn't started the ascent yet but I was already feeling a bit worn-out. 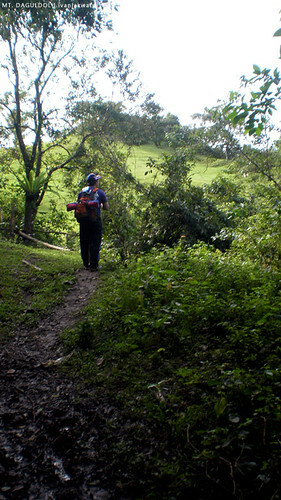 We continued the walk until we reached Sitio Catmon, and there we started the ascent. I remember Mang Lizardo told us upon reaching the foot of Mt. 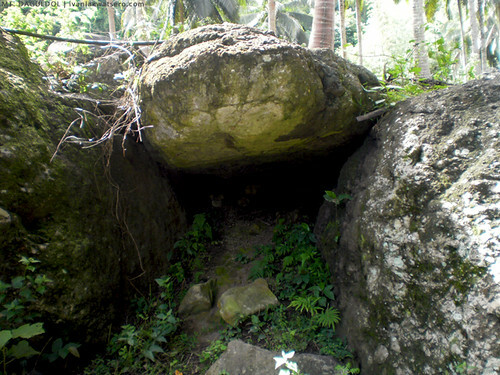 Daguldol, "baka gusto niyo muna magpahinga, paakyat na tayo sa bundok". But the four of us, excited and confident, refused to stop and by 11:30 we started the climb. Fifteen minutes after the non-stop hike, we reached the first resting station. I was so dead tired, exhausted, worn-out, drained, and weary! My feet were aching badly, (still aching as I am writing this article) and I was panting to the max. 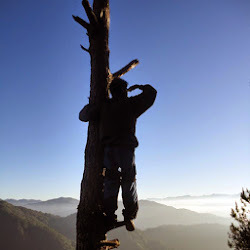 Every minute, I kept on asking Mang Lizardo how far are we still from the summit, but I always get the same answer, "malayo pa". We only rested for 5 minutes before we continued the trek. From this point (1/4 of the total climb), I am dead tired already. "I don't think I can make it," I told myself while listening to my heart beating fast. Less than 15 minutes and again, I dropped my bag and rested at the ground (nahiya naman ako sa mga kasama ko, kaya go na lang ng go kahit masakit na ang mga hita ko). 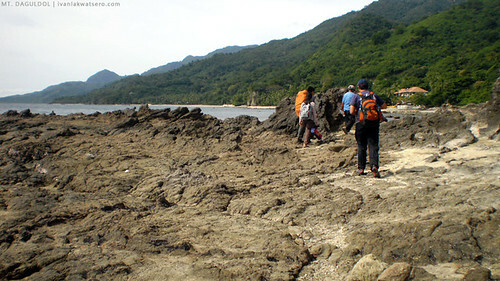 Mang Lizardo also pointed the trail that will lead to Naambon waterfalls. 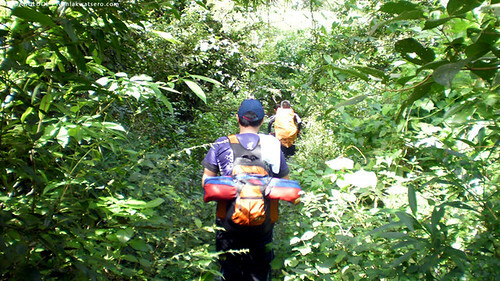 By 12:30 PM we reached another resting station, and as always, I was panting and my heart was pounding. We again asked Mang Lizardo and he told us that we're nearing the half of the trek which is his house (owmaygad, wala pa pala sa KALAHATI, e sobrang pagod na ako). "Merong malamig na softdrinks sa bahay ko," Mang Lizardo added. That's just wow, we want ice cold soft drinks! For another fifteen minutes we reached Mang Lizardo's Place. welcome to Mang Lizardo's place, where they sell the best softdrinks. 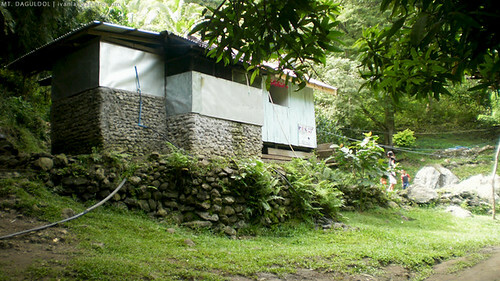 Pan-shot of Mang Lizardo's Place, the half-way spot. "Aaahhh" the taste of the best ice cold soft drink ever. We rested again for 20 minutes while enjoying the ice cold drink. 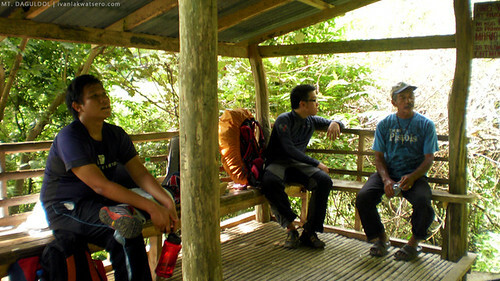 Mang Lizardo stayed at his humble house and had his nephew, Kuya Ugus, to guide us to the summit. Also with us was Kuya Ugus' dog. 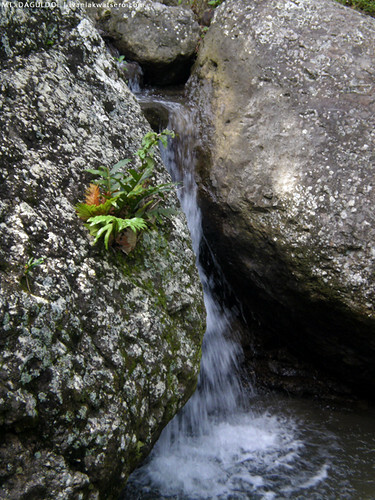 We came across some grazing cattle, huge boulders, and small waterfalls. 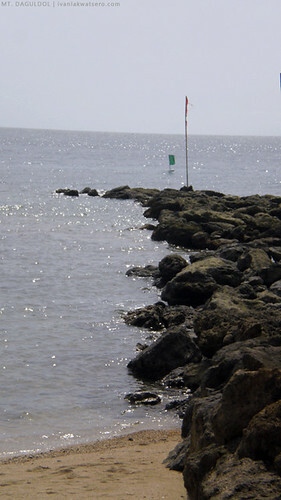 The view of Verde Strait and the Island of Mindoro were now seen. 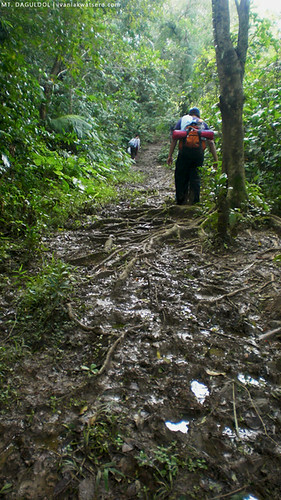 The trail was becoming more muddy as we near the summit. As in your foot would sink deep on the mud. 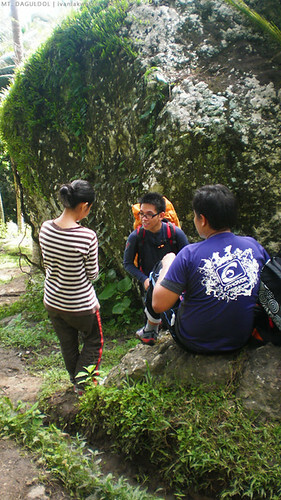 By 02:10 PM, we reached the last resting station (30 minutes away from the summit). After 10 minutes of rest, we continued the trek. We passed through an extremely muddy pass where our feet sank badly. 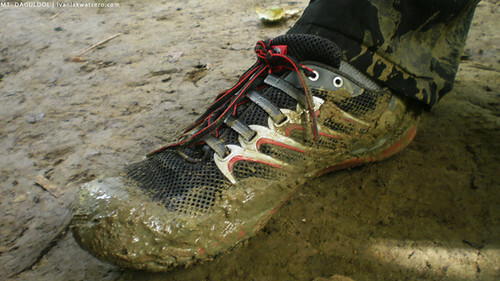 I can even hear the squirting sound on every step that I made on the mud trail. A few more steps and vwalla, welcome to the summit. ugh, I love the feeling of mud! there it is, the glorious peak I'm dreaming of! yihaa to the first climb! medyo may thrill pala to kasi di pa umabot sa summit. abangan namin. congRAAAAtulations!!! First Climb! 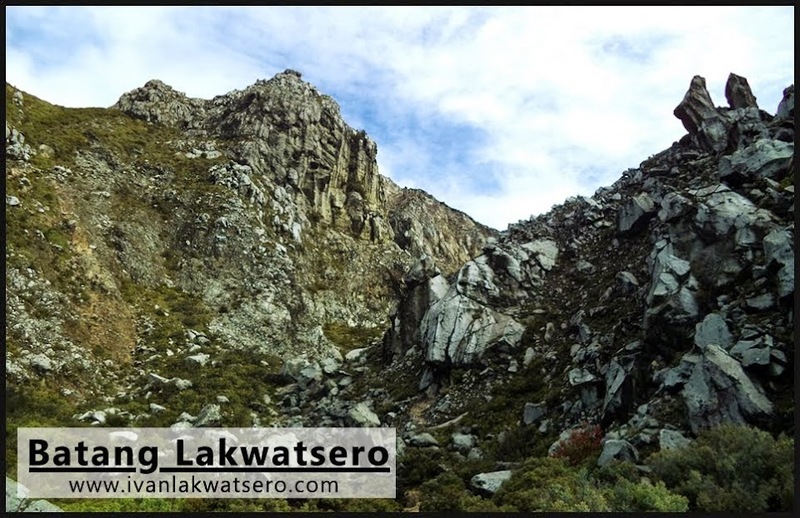 Sama sama na tayo sa next hike! Marami pa ko hindi naakyat! @anonymous, oi enteng haha ganun tlga para may epek. @mervz,anong hndi mahirap. 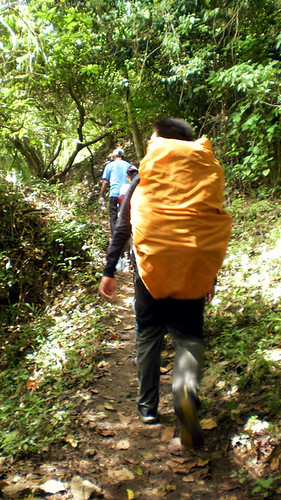 haha, ansakit nga ng paa ko hanggang ngayon e. haha.. at ang legendary mang lizardo tlga ang guide namin haha..
@dermin, taralets, I'm actually crving for more! Congrats sa unang akyat mo, Ivan. 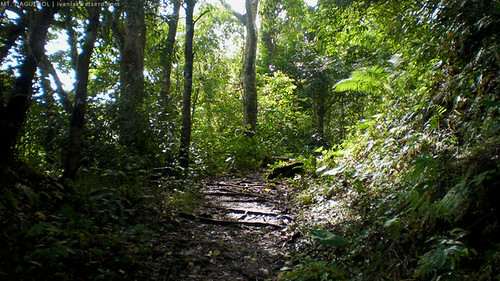 I am happy to see you hitting the trails! Lol at the best softdrinks, pangit ba sa ibang tindahan? Hahaha. But yeah I got what you meant. 1. If the guide asks if we want to rest at the foot of the mountain, say YES. 2. Don't wear fashyown boots. We climbed Mt. 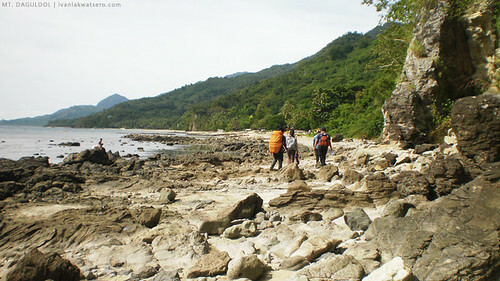 Daguldol yesterday and thank you so much Mr. IvanLakwatsero because we totally used your blog as a guide. 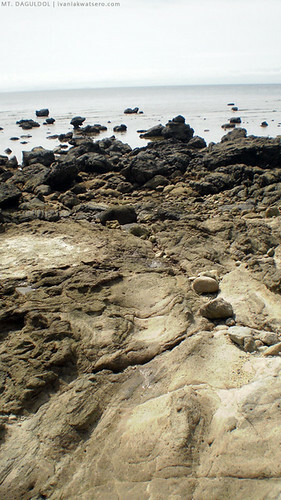 However, as we searched for Manong Lizardo, we learned that he already passed away last year. It was sad because we were really looking forward to meet him. On the other hand, the other locals were very nice and accommodating.